As we bid adieu to 2018 and enter into 2019, here we are going to discuss some digital marketing trends that will hold the key for the success of any firm or organization. The world is changing fast and with the advent of new technologies, a business needs to adopt new digital marketing strategies in order to be successful. So, here are some digital marketing trends to watch out for in 2019. The world has now not only realized the potential of AI but also trying to use it in order to make human beings’ jobs simpler. We can’t deny the fact that the whole world knows about AI but only a few understand its scope and direction in the future. In 2019, AI will certainly be the most important digital trend for companies to look out for. The user base of world’s most famous and easy video-sharing platform – Youtube has grown significantly in the past few decades. Other than to entertain and educate the audience, companies can post videos on Youtube for digital marketing purpose too. Not only Youtube, but also Facebook and Instagram provide video sharing facilities. The companies can take help of these technologies because information and brand’s motto can be conveyed better with a video rather than a print advertisement. Chatbots, simply put, can interact and communicate with humans in a very natural way and help us greatly in completing complicated tasks. Chatbots are widely used in companies like Facebook and Uber to interact and provide better services to the customers. Chatbots will definitely continue to be an important digital marketing trend in 2019. We all know about Siri, Alexa and other innovative devices which are making voice interaction between humans and machines easier and simpler. However, this technology is still not used by a wide number of companies because (1) humans sometimes find it difficult to communicate with and (2) these technologies are rather expensive. But it is obvious that as we enter into 2019, this technology will evolve and will certainly be something to look out for. The companies need to understand that they can convey a lot of information to the users using different technologies but quality always matters more than the quantity. So, the companies can combine good content and innovative marketing strategies along with new digital marketing trends to not only achieve goals and ensure profitable business but to also cater to the ever-changing nature of the consumers’ interest. 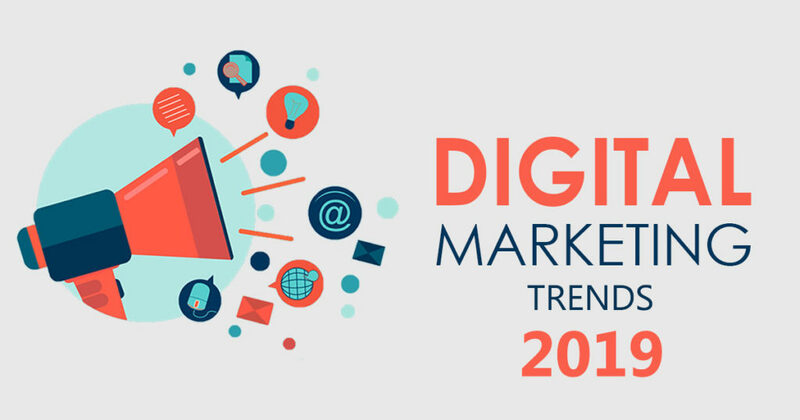 Looking for the top digital marketing trends for 2019 to follow in order to improve your business visibility and get noticed by the target audience.